there was a chance not so very long ago that Britain might be able to count on being in a position to Leave-The-EU and it is astonishing that this opportunity is being destroyed not by our enemies but by those who pretend to the leadership of the Leave Campaigns! We knew and warned long ago that David Cameron would totally fail to get the most meagre of reforms of the EU despite having set out to bargain for very little he didn’t even achieve that and unlike Neville Chamberlaine came back from the camp of our enemies empty handed! Neville Chamberlaine came back from talks with Adolf Hitler waiving a piece of paper he had cleverly obtained, together with Alex Douglas Hume, a piece of paper that duped Hitler into the belief that Britain would not act against Germany; terms Hitler was duped into offering that gave Chamberlain the opportunity to buy time claiming, as he waived the paper, ‘Peace in our time’. It is little known that arriving back at Downing Street as he and Douglas Hume walked back into the Cabinet Office, where they were awaited by The Cabinet, before they had even sat down Chamberlain announced ‘Prepare for War Gentlemen’. In the period of time he had managed to obtain Britain was able to gear up for that inevitable War & ensure we had the planes and armaments and production in place to sustain that War and go on to win it defernding not only ourselves but Continental EUrope from being over run by a single malign Unifying Power intent on centralising control and expanding militaristically to ever greater fulfillment of Germany and her allies’ ambitions. Despite the efforts of MacMillan and Eden and others it was not until the lies of Edward Heath, Harold Wilson, Geoffrey Rippon and their supporters that Britain was finally betrayed in 1975. Read the book of the details of how the Deception was achieved CLICK HERE and the detailed history of the 1975 Referendum CLICK HERE with additional details HERE – astonishingly you will note once you have read the last two that it would seem that those leading the various squabbling Leave Campaigns that they are using the history of that debacle as an instruction manual as they replicate all the same errors and stupidities that resulted in the last 40 years of vassal status of Britain and the abject loss of our hard earned democratic rights. The more astute will have noted that the Remain Campaign haven’t a sound fact to back their duplicitous aims and claims – they are yet again basing their position on a mythical and duplicitous claim of a series of special benefits of being in the EU when there are clearly none and using the same FUD (Fear Uncertainty & Doubt) used in 1975. It is claimed that Britain is Stafer-In when the mismanagement of borders & immigrants has shown, together with terrorist attacks in Belgium, Paris, Spain and Britain have shown just how untrue that is and just how poor is the co-operation of intelligence. The lie is given to the claim that we are Stronger-IN by recalling The Falklands War when Britain found that, when Argentina illegally invaded The Falklands, France had supplied Excocette Misiles to Argentina, Spain seemingly supplied intel to our enemies and Belgium threatened to cut off supply of ammunition to Britain – it was notable that not one of our claimed allies in The EU supported Britain. So much for being safer-In! The Remain-Campaigners are left with the mythical and unsustainable claim that there are great risks when Britain Leaves-The-EU trying to imply there are no risks if we remain! Clearly in this modern and competitive world with terrorism and population migration omni present there are risks both if we remain or if we Leave-The-EU. Undeniably the benefit when we Leave-The-EU we will be indisputably in the position that we can manage and control those risks democratically in the interest of our Country, our peoples and our allies whereas if we were foolhardy enough to remain we would be leaving our safety and security and the inevitable risks to the management of the undemocratic and cumbersome slow reactions of the unelected bureaucrats of The EU, each acting on very different motives to those that serve the interests of Britain and dependent on QMV! It is risible and dishonest to imply that Britain would be isolated when we Leave-The-EU when as the 5th. largest economy on the planet we would be liberated to make trade deals with allies and partners globally rather than wait for the bureaucrats of Brussels to act on our behalf when considering the interests of 28 member states. Of course Britain will be better off out in the long run and of course there will be a period of transition which in the interests of both Britain and our trading partners in the EU, Europe and the rest of the world will be made as stable and smooth as possible – it suits no one to cause instability in Britain as such instability in the 5th largest economy on the planet could prove difficult for all leading ecomomies. There is a very clear plan on how we can responsibly Leave-The-EU ensuring the transition is safe, smooth and detailed to ensure no disruption or damage to ourselves, our allies or our trading partners – that those making the pretence of leading the many Leave-Campaigns are too lazy or too stupid to have read it is hardly the fault of the British public who can all read it if they CLICK HERE. The failure of those pretending to leadership of the Leave-The-EU Campaigns to fully address the issues of a safe and responsible withdrawal from the EU by reading and becoming coversant with the plan on offer, and none of them have produced any kind of detailed plan, has put the scoundrels in the remain-campaigns in a position where they can claim the Leave-EU campaigns have no plan and no vision a position enforced by the crass incompetence of the French domicile Nigel Lawson as a leading light of Vote-Leave Campaign on the Andrew Marr programme earlier today! The betrayal of the hopes of so many responsible individuals seeking to Leave-The-EU, by those pretending to leadership of the various Leave-Campaigns – bereft of leadership and with squabbling Leave-Campaigns the responsible aim to Leave-The-EU is severely damaged. Of all the people in the world that the Marr Show could have picked to represent the leave campaign this week, the BBC chose Nigel Lawson, the geriatric former Conservative chancellor who nearly wrecked the British economy by shadowing Deutschmark without Thatcher’s approval. 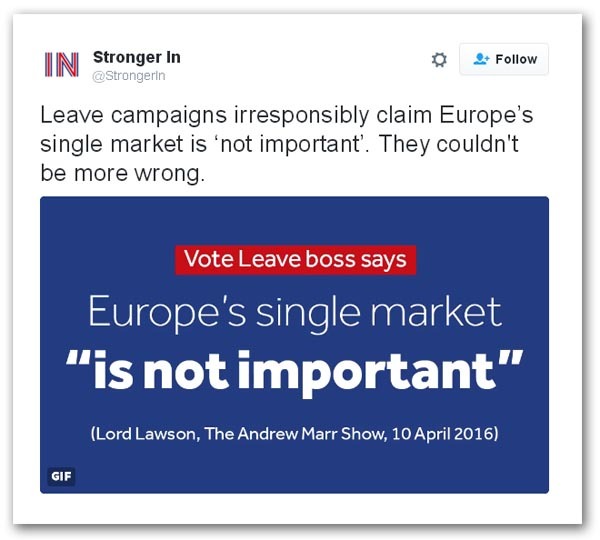 Not content with the economy, he is now set on wrecking the leave campaign, telling Andrew Marr that the Single Market is “not important”. The EU’s Common External Tariff, averaging out at 3-4 percent is “trivia”, he grandly declares, and as a result is “not an issue”. The whole point about the tariff structure, though, is that different products attract different rates. Many are zero-rated but agricultural products carry a 32 percent penalty under certain circumstances, and many individual items carry even more. The detail, to a wide range of economic enterprises, therefore, is very far from “trivial”. Attacking (or neglecting) the Single Market is the Eurosceptic equivalent of invading Russia in winter. Collectively, enough interests would be damaged by Lawson’s ideas to make a difference. They could make a serious dent in support for leaving the EU. Unsurprisingly, therefore, Stonger In thinks Christmas has come early. For the “leave” campaign in general, this is a massively important own goal. Not at any price can we afford to put the Single Market at risk, especially – as we have always argued – the Government is relying on the status quo effect to carry the day. Time and time and time again, we have argued that unless the “leave” campaign can provide reassurance that Brexit is both practicable and safe, we will not break the fear barrier. Yet here we have Lawson handing the game to the Government on a platter, going out of his way to dismiss legitimate fears in that cavalier, offhand way that only Tory grandees seem to have perfected. But what sort of response does the “leave” campaign think it is going to evoke when voters have their fears dismissed as “not important” and “trivial”? But then, this should have been expected this. We have in Lawson a man who completely messed up the IEA “Brexit competition” and who now thinks a trading relationship based on WTO rules would be “far from disaster”. The man who didn’t realise that the ERM was a precursor to the euro hasn’t even begun to think about non-tariff barriers. Bizarrely, though – even as Vote Leave spokesman declared that, “People need to be reassured that by voting to leave, their job is not being put at risk” – we had Matthew Elliott, CEO of Vote Leave, rush to twitter to gush like a teenager that Nigel Lawson was “a class act”. 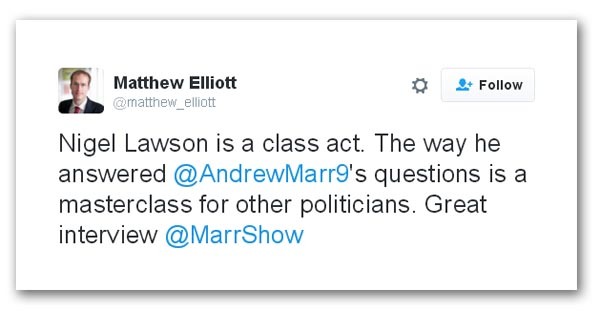 Trilled Elliott: “The way he answered Andrew Marr’s questions is a master class for other politicians. Great interview”. This is crass beyond crass – and especially so when the arrogant, malign fool that is Lawson had not even finished in his attempt to destroy the campaign. Asked about border controls in Ireland, the idiot told Marr that border checks would have to be resumed. If there could possibly be a more sensitive subject, I would like to know what it is. In one fell swoop, Lawson has just wiped out the Northern Ireland “leave” vote. And what is especially galling on this is that I personally have spent several weeks researching this issue and crafting a sensible “line to take”, culminating in this piece, with another yet to come. Recently, Owen Paterson and others toured Nothern Ireland to re-assure the voters there that there would be no resumption of border controls, an activity that entirely reflected Vote Leave policy. Yet, here we have this man, in a matter of seconds, destroy hundreds of hours of work, setting back carefully crafted arguments and possibly wiping out the entire Northern Ireland vote. Yet still Elliott applauds him. Thus, while we see on this blog many comments from readers complaining about our criticisms of the “leave” campaign, here we have exactly an example of what I’ve been complaining about. From a personal perspective, I simply cannot be expected to stay mute, while working hour after hour, week after week – as I have done for years – only to have my efforts destroyed in seconds by idiots such as Lawson. That is the point which so many of my own critics seem to miss. Some expect (and even demand) that I should devote my time and skills to this campaign, producing technical analyses for them to use, but I am not allowed even refer to the continued damage caused to us by the incompetence of the leave campaigns. Seemingly, even though they at times seem that they are intent on sabotage, in the interests of some notional unity, I should say nothing. There are even those who complain vociferously about my attacks on Alexander (aka Boris) Johnson – from those who seem to think that his popularity in a two-way fight with David Cameron would make up for his incompetence and the minor fact that he – by his own admission – is not a “leaver”. And only this weekend to we see reports in the Guardian and the Mail that Johnson might be offered a Cabinet post after the referendum. And some readers still want me to refrain from criticising a serial liar who can be no more trusted than fly? That is not going to happen. Had the media not been so obsessed with Mr Cameron’s tax affairs, this Sunday could well have marked the day when we lost the referendum. It was always going to be difficult to win, and Lawson just made it that bit harder. We, of course, exist to pick up the pieces and it would be a breach of faith to all our readers and donors to give up now, and there remains the possibility that we can win through. If we don’t keep trying, that miracle cannot happen. Thus, the meeting on 23 April will go ahead and we’ll continue campaigning with a vengeance. But there are limits to tolerance. I am not going to ignore the “leave” campaign’s attempts to sabotage the entire referendum. We simply cannot win if everything we do is undermined, and it is thus entirely necessary and justified to deal with the enemies in our midst, as well as those without. In many ways, those in our midst are more dangerous. I will do my best to change minds about the direction of the campaign. But I’ll be there for the reckoning afterwards if I fail and we see people’s dreams destroyed by the crass individuals about whom we already know so much. And if I’m angry now, you ain’t seen nothing if we find ourselves needing to confront those who would betray us. As one of my readers so rightly says, right now if you’re not angry you’re either asleep or a sheep. Be assured, I will not be alone in my anger. Previous Previous post: Spurning The Chances Of BreXit Victory – 1975 All Over Again!